This weekend was spent, packing, stressing, packing, then stressing some more. Why? Because today I am off to Australia for three weeks. But before we talk about today, let's talk this past weekend. Mine started off on Thursday (mentally) because I booked a flight to Chicago!! I'm going to stay with my lovely Weekend Update co-host Dana, and Sami, my other equally lovely Weekend Update co-host will be there, too! Talk about the ultimate Weekend Update! Sami threw around a the idea of a vlog featuring us three hosts so hopefully that happens. While I'm there we get to hang out with one of my favs, Chris of Chubbette Tales...Life After Spanx and hopefully I'll get to see more Chicago ladies like Stephanie of Bourbon and Glitter! So.Super.Excited. On Friday I went to dinner with IRL-friend-turned-blogger, Kathrin of Shop.School.Sleep., in our hometown for sushi. Much needed after my brutal work week, and my upcoming trip. Saturday I got my hair done. Thanks for everyone's opinions, ultimately I decided to go back to blonde, and re-dip dye my hair when I return if I am still into it. 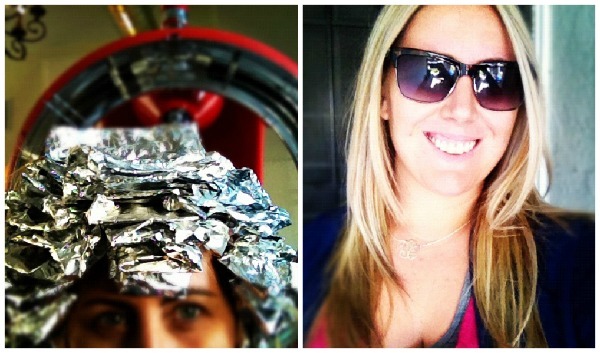 So many foils were needed to get rid of the blue! I am loving being a complete blonde again. You ladies are going to have the BEST time!!! You better do a vlog!! ;) And the new "do" looks fabulous!! Getting so excited for your trip...and slightly jealous! Have a great week! Yay for weekends that start on Thursdays thanks to peer pressure from me, Sami and Chris to book a trip to Chi-town! I can't wait to hear all about your journey to Australia. When you come back, it will soon be time for some fall fun in Chicago. Since we are moving in a few weeks, my new house may still be in shambles when you get there. Have a wonderful, wonderful trip and take lots of photos! Loving the new do!! And I cannot wait to read about all of your Australian Shenans!! O my goodness, I am so jealous. Your hair looks great! We hope you have a wonderful trip and we can't wait to hear all about it!! 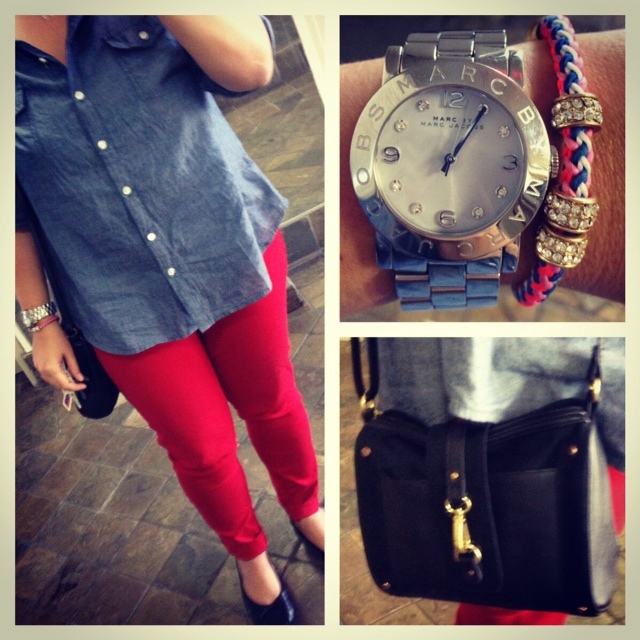 Your outfit for Friday is adorable I love the classy casual look. Very pretty. I love your hair! Have a GREAT trip. I can't wait to hear all about it. The hair looks awesome! I think you made the right choice. Have fun on your adventure! The colorful hair tips were pretty rad but you look fabulous as a 'whole' blonde. so excited for you to go to Australia. i cannot wait to hear all about it! Your hair looks awesome! You're ready for Australia! You are going to have a brilliant time down under! Don't forget my kangaroo. Plus the sooner you go to Australia and come back the sooner you can home to CHICAGO!!! Have an AMAZING time, gorgeous! Have SO much fun in Australia!